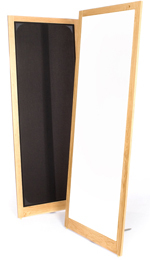 Podium loudspeakers are quite literally a world first: an efficient full-range panel loudspeaker system. The Podium 1 has all the positive attributes of the classic loudspeaker designs we grew up with; the ones we all know, love and respect. But we also achieve something extra-difficult to define in words. Visceral credibility. comes from music heard played live. Uniquely, this is achievable at any volume level and any listening position in any room. The traditional ‘sweet-spot’ and specific volume requirement described as ‘realistic’ by some and ‘rather too loud’ by others are both startlingly absent.